I am always looking for new ways to use liver. I hate its texture, you see, and there’s only so much pate and sausage I can eat. So when I saw Chef Brad Farmerie make a pig’s liver creme caramel at a conference, I knew I had to try making it. Liver. Creme. Caramel?! Yes, it’s true. It sounds nasty. I know. But it really, really isn’t. The texture is a little like flan, and a lot like creme caramel, which is flan’s French cousin. The flavor is only mildly livery — after all, you’re using only 40 grams in a four-person serving, which is less than 1/2 cup. It’s more like an umami-rich, slightly sweet wave that wakes you up. You think, “My, this is alarming. But I think I need another bite.” And in no time, you’ve eaten it all. What liver to use? Why any of them, silly! That’s the beauty of this dish. It works with any wild game liver, or any domestic liver for that matter. I first nailed this recipe with wild boar liver, so that’s what I’ll start with — but I’d do it with duck liver, wild turkey liver, pheasant liver, rabbit, venison or whatever. Be sure to soak wild game livers in milk overnight before making this. you’ll need by following the link; six of them will only set you back $10, so it’s not spendy. Make the caramel. In a small pot, heat the sugar over low heat until it melts. Be sure to pay attention or it will burn. Take your time and don’t rush by turning up the heat. Once the sugar has melted, pour in the honey and the vinegar and stir well. It’ll sputter and spit, but that’s OK.
Take it off the heat and paint the caramel into the bottom and sides of your ramekins. Make the caramel. In a food processor, buzz the liver and the egg until pureed. Do this in pulses so it does not get frothy. If it gets frothy, stop and wait before processing some more. In another pot set over medium heat, pour in the milk and cream, then the soy sauce, sugar, porcini mushoom pieces and quatre epices. Stir to combine. You want this to come to a boil slowly, so again, don’t rush it. Temper the egg-liver mixture by stirring it with one hand, and drizzling in a ladle of the cream mixture with the other. Do this 4-5 times, and then pour the liver-egg mixture into the cream. Take this off the heat and pour it through a fine-meshed sieve. You don’t want any coagulated egg, mushroom pieces or liver shreds in your caramel. Get your tap water as hot as it will go, and pour it into a casserole up to about halfway. Pour the egg-cream-liver mixture into the ramekins, leaving a little room at the top. Cover the ramekins with foil and put them in the water bath. Bake in the oven for 45 minutes before checking. Check one, and you should see that the egg has set but the creme caramel is still wobbly. If not, cook some more. Once the custards are all set, remove them from the water bath and let cool — still covered — for 30 minutes. Take the covers off and put the custards in the fridge for an hour. Serve, or cover with plastic wrap for up to a day. To serve, shake the custard back and forth on the counter until you see the edges come free. Upend the custard on the serving plate. It should come free cleanly, surrounded by a pool of the caramel. 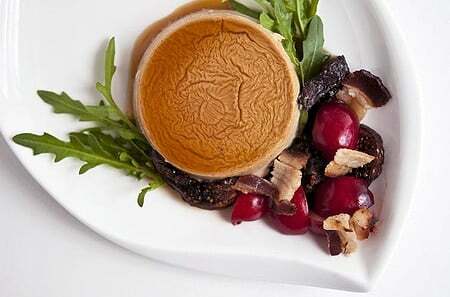 To garnish — and garnishes are important, use a combination of something crispy (bacon or fried lardo or pancetta), something sweet (cherries, in this case), something tart (dried figs soaked in balsamic vinegar) and something bitter, in this case wild arugula. Great recipe — doubled it this time. Any ideas on freezing,, or should I find close friends and pass these out ? Worth the extra effort to make. This was a hit with my slightly squeamish family members, so I’ll certainly be making this again.